We are currently reading Shakespeare in my English II classes. Throughout this day, his work has lingered and rendered no small measure of sweetness to my soul. With every stroke of his pen, he called forth worlds that fed the imaginations of hungry audiences. And so I have also wished to wield a brush, and shape worlds with my own series of strokes. 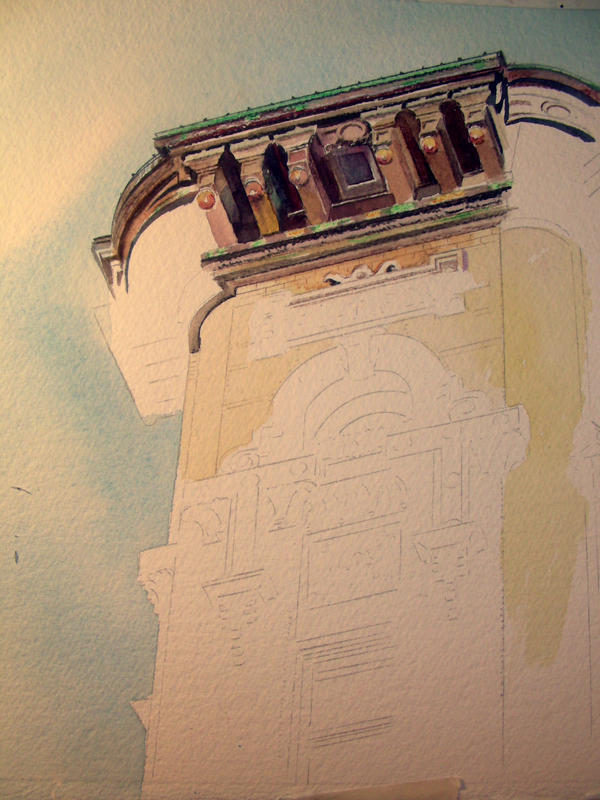 After all these years, I am still enchanted by the mystique of watercolor. While working in the studio, as I did this afternoon, I love to watch worlds emerge, shimmering on the wet surface of the paper. Perhaps the photographer in the dark room felt the same delight, watching the image form on the photo paper as it lay in the fluid. As I poke around on a new painting, I feel genuine pleasure watching the developing composition respond to my pencil or brush. 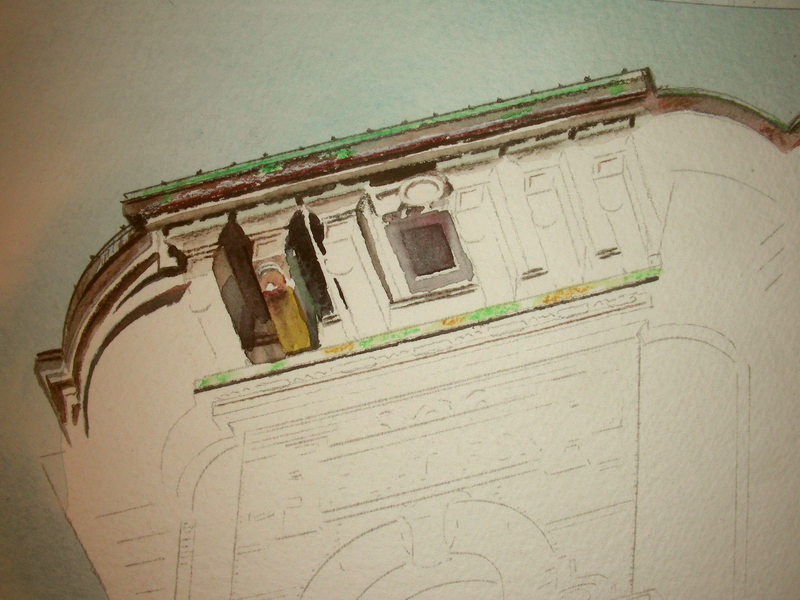 Inch by inch, color by color, line by line, I feel a growing satisfaction watching the painting emerge. I am seriously considering a change in the composition of this Fort Worth Flatiron. It was going to be a 9 x 12″ vertical piece, with two additional stories developed below where I am working. This afternoon, I lay a 10 x 8″ horizontal mat over it, and have just about decided I have gone far enough down, and may perhaps move to the right and finish out the cornice and upper story. I like the horizontal look I saw this afternoon. So . . . I’ll let this one rest a bit more, and decide later how exactly I want to finish it out. I have returned to my home and studio, tired, but fulfilled from the past two days’ excursion. I entered the Lower Mountain Fork River a second time yesterday morning, having awakened around 7:15, rested and refreshed and ready. It was 35 degrees, and with the added layers of clothing, I still remained uncomfortably cold, yet stayed in the stream much longer. After fishing for about 30 minutes with no luck, I pulled in my line and found that I had lost my nymph! Talk about disgusted, fishing with an empty line for that long. Embarrassed, stupid–I could not find enough words to describe myself, freezing and wasting my time. I tied on a #20 Ruby Midge and drifted for another thirty minutes with nothing. I decided I had given it long enough, I was cold, and ready to call it a day, grateful at least for what had happened yesterday. I began reeling in the line, absent-mindedly. By the time half of the line was on myspool, a large rainbow struck, surprising me. I held him for about 15 seconds, and then he broke off. I got a good look at him–comparable to the large one I had pulled in yesterday. Well, I couldn’t stop then! I tied on a #20 Olive Midge and went back at it again. 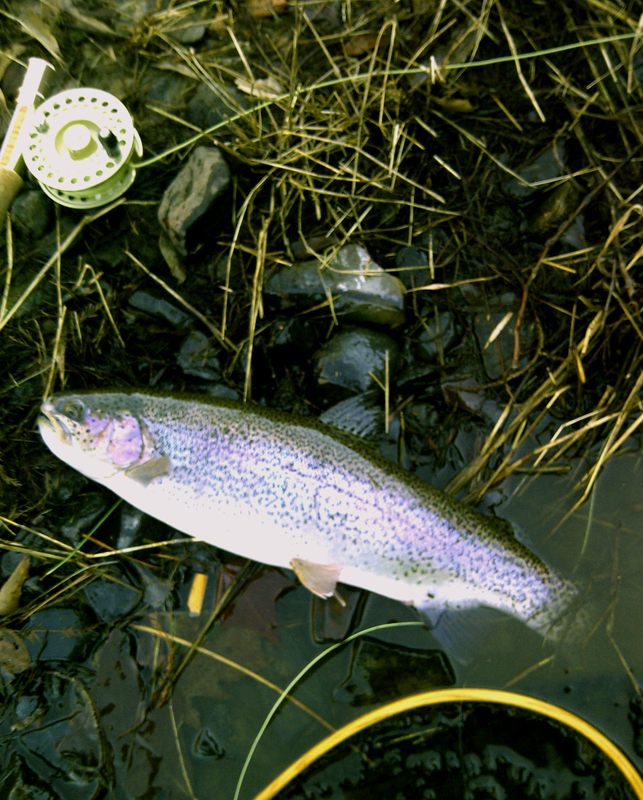 Thirty more minutes passed, then I tied into the nice rainbow photographed above. This one took quite a while to get into the net, but I managed, and this time measured (I was too excited and thrilled to remember to measure the one from yesterday). This one measured 18″ and was very fat, like the one from yesterday. 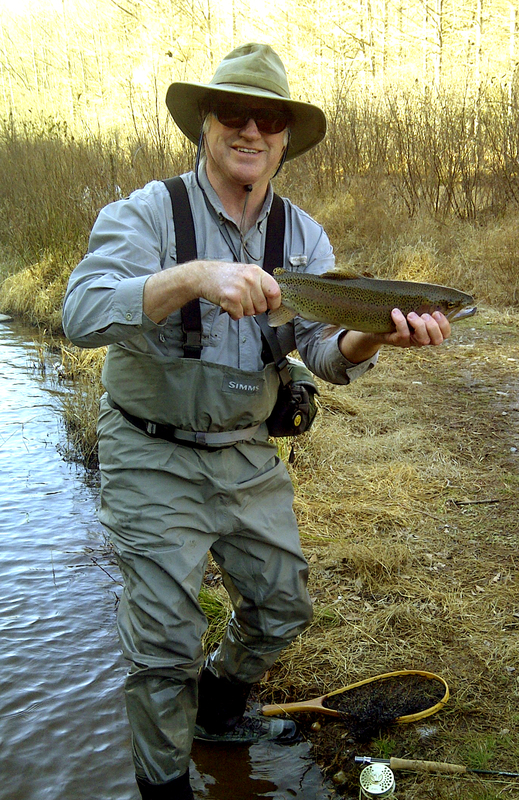 Another freezing thirty minutes went by, and a 12″ rainbow got on. Of course, it took very little to get him into the net, and I didn’t bother photogaphing. My hands were raw from the cold and wet. I don’t think he minded not getting his picture taken. Another thirty minutes. Then my strike indicator suddenly vanished, and I felt a monster on the other end. This one I worked a long, long time, clearly bigger and heavier than the others. I got a good look at him. Huge. I never got him near the net. He broke off. I just took a deep breath. At least I got to see what was on the other end, a very handsome rainbow. Thirty minutes later, nothing, and then I knew I had to get out of the stream. I never did get comfortable with the temperatures. And I’m glad I had something to show for the time spent. I finally took a picture of the guy on the other bank who stalked me the entire time I was there. No kidding. As I moved upstream, he always took the same number of steps, always staying opposite me. 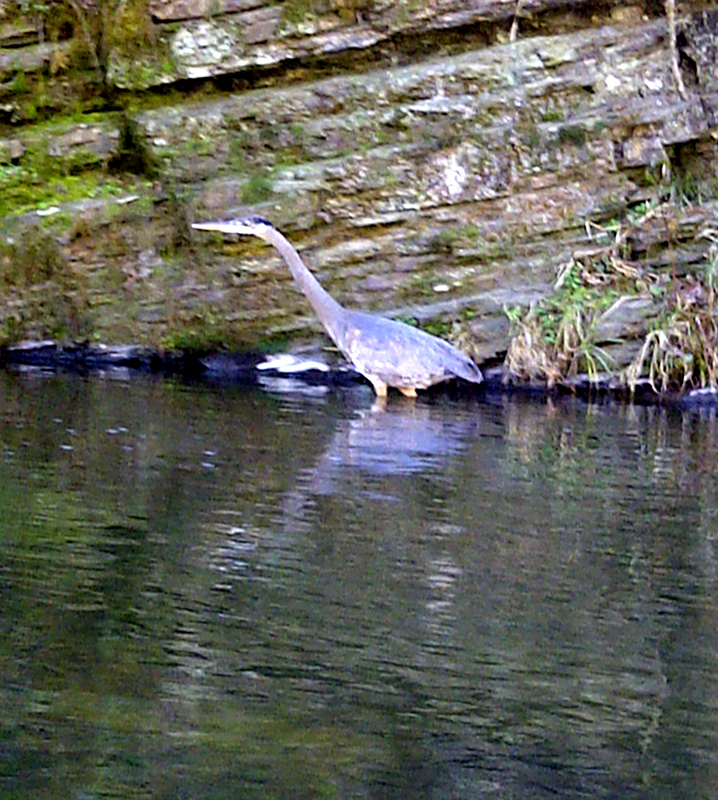 There were more than a dozen other fly fishermen all up and down the stream. They all laughed, wondering the same as I, why I was the one the bird decided to accompany. He did bring luck. The contrast of the past twenty-four hours could hardly be sharper. Last night found me in the Jazz-infused din of the Dallas Museum of Art, dressed in evening attire and enjoying the strolling crowds. Today found me three-and-a-half hours away in an Oklahoma trout stream, wearing (more comfortable) fly-fishing regalia, and standing beneath the shadow of a massive rock, looking into the recesses of dark waters and rising trout. With this being a three-day weekend, I decided I needed a little time away. Though the thermometer registered 61 degrees, the stream lay in the shadows of a deep gorge, and freezing winds shrieked down the corridor. It didn’t take long to hook a small 8″ rainbow trout, and it was exciting to see him shatter the surface of the stream to take down a dry fly. As my hands got colder, and I wondered about the wisdom of standing in such a frigid environ, my dry fly suddenly disappeared, and when I hauled back, I thought the rod was going to be torn from my hands. 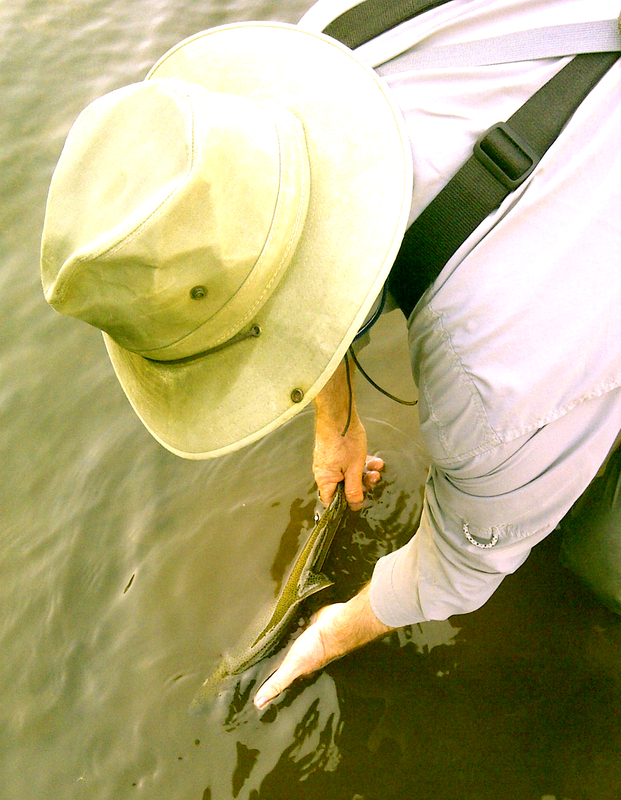 The ensuing sound of the rolling surface was not the splish-splash of a small, feisty trout, but the fat body of large rainbow rolling the surface. I heard gasps up and down the river, and was shocked to realize that surrounding fly fisherman “heard” that as well, and all stopped fishing to watch. What followed was an aerial show as this huge creature did everything he knew to throw the barbless hook, and frankly, I still don’t know how I managed to hold him. 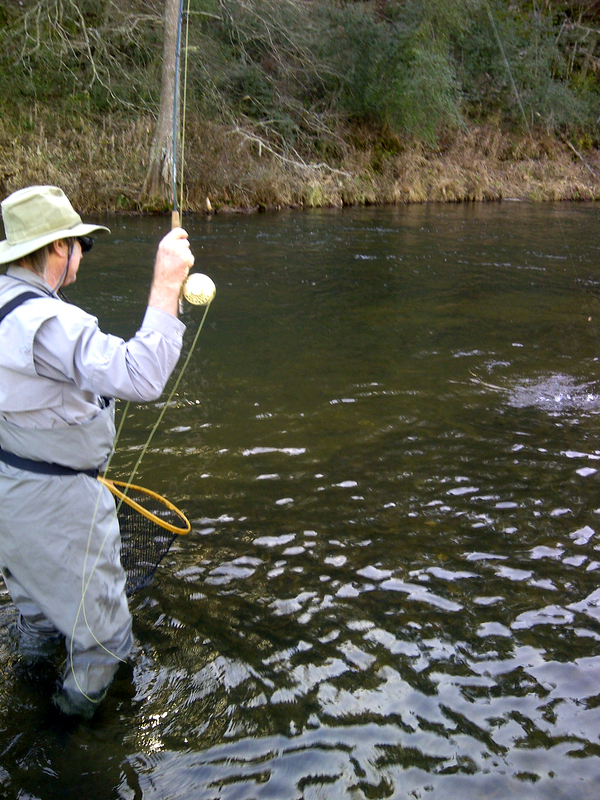 By the time he was in the net, I was shocked to see that the hook was straightened out to the shape of an “L”. He was magnificent to hold as I rocked him in the stream after the photo, slowly feeling his strength return, and watching him swim out of my hands and back into the current and away. By that time, my hands were freezing from keeping them in the water so long. I could not see the day getting any better than that. So I left in search of a warm place to land once again. Beauty suspends the desire to be elsewhere. I could not have asked for a more beautiful, satisfying Friday. Somehow, I was awake by 5:15 a.m., and ready to scamper to school for a day of art history. All of my classes spent the entire period examining the life and art of Robert Motherwell and the Greenwich Village culture in which he thrived. I had an amazing lunch hour, spent in the company of this amazing nucleus of students whose lives overflow with the arts. I always miss them before the door closes behind the last one. This evening, I met with a gathering of artists and community art lovers to discuss ways to develop a cultural district in our town. 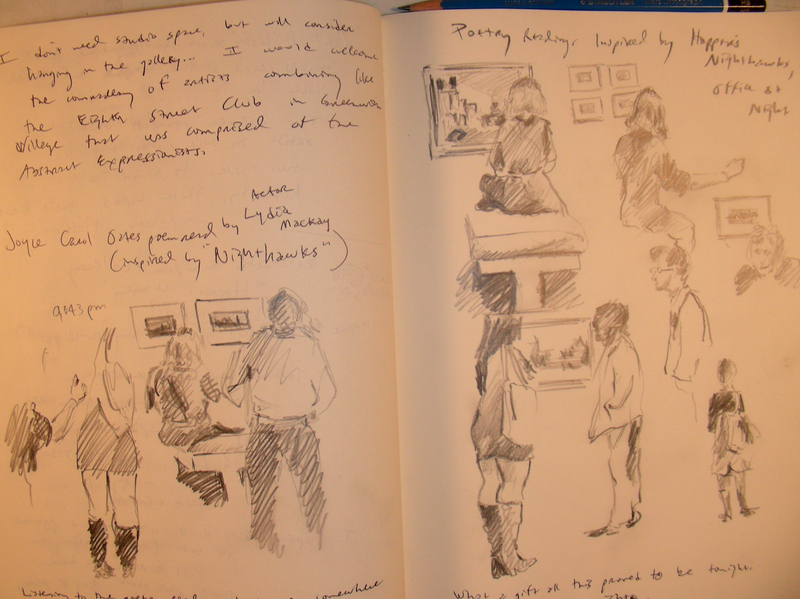 I felt for the first time in my life like I was connected to others much in the same way the Eighth Street Club launched the Abstract Expressionist painters in Greenwich Village. Granted I spend most of my after-work hours in solitude, today was a good day to be surrounded by people. Following this evening’s community meeting, I decided to return to the Dallas Museum of Art for the second night in a row. Tonight was the monthly “Late Nights”–the museum stays open till midnight, featuring festivities of live music in the cafe, lectures in the auditorium, and poetry readings in the gallery where the Hopper Drawing exhibit is hung. I spent the entire night perusing every gallery throughout the museum, the same as I did last night. All of it was beautiful. And the crowds were enormous, like a weekend shopping mall–only this was a multitude of art lovers. And a sweet multitude it was. In the gallery, actor Lydia Mackay was reading poetry inspired by Hopper’s work, including Joyce Carol Oates’ “Edward Hopper’s Nighthawks, 1942.” As her lovely voice filled the chamber, and museum visitors milled about, listening, I took a seat in the back corner and sketched the environment until the reading was over. Figure drawing is my Achilles’ heel–I haven’t devoted Malcolm Gladwell’s “10,000 hours” to the discipline, so I struggle still. But boy, did I enjoy the process. I enjoyed looking at every person drifting through the chamber and did all I could to capture gestures, postures, figure lines. And I felt complete. I’m glad I chose to stay up late, despite the early, early beginning to this day. At least tomorrow (oops! today!) is Saturday, and there will be no alarm clocks driving me from my bed. Thanks for reading. I’m still vibrating from this delicious day and night. True happiness is of a retired nature, and an enemy to pomp and noise; it arises, in the first place, from the enjoyment of one’s self; and, in the next, from the friendship and conversation of a few select companions. After a challenging day in the classroom, I was gifted with enriching conversation over lunch and coffee with a friend whom I hadn’t seen in years. It was great catching up on old times and talking in depth about values that have mattered to both of us. I was so thrilled with the respite. Following that enriching conversation, I headed east into Dallas. 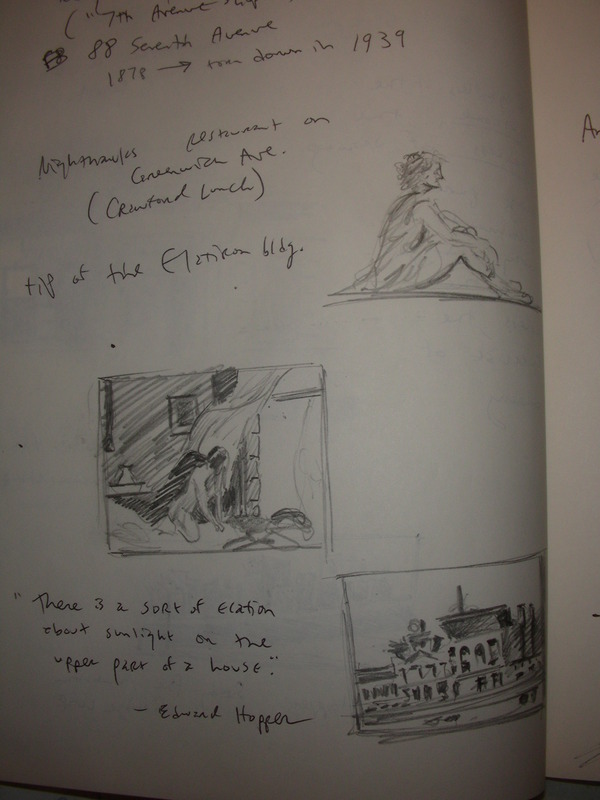 The Museum of Art is open until 9:00 p.m. on Thursdays, so I thought I would get my “Hopper fix.” This time I took a pencil and made a series of thumbnail sketches and notes in my journal. As the night unfolded, I alternated three separate excursions through the Hopper gallery with side trips through the European, American, Meso-American, African and Far Eastern exhibits. I took my time, and the longer I strolled the galleries, perusing the works, the more I became aware of how my breathing changed and how sweet the environment became. What I was not prepared for was the engaging conversations that occurred with three of the guards overseeing the Hopper exhibit. I am not used to museum guards having anything to say, but this trio was absolutely stunning in their depth of knowledge and appreciation for Hopper and their enthusiasm for art in general. I didn’t want to leave. And frankly, I cannot wait to return to the Dallas Museum of Art for the chance of conversing with them further. I wish I could give them a “shout out” on this blog, but I feel I need to protect their identities, so . . . if any of you read this, THANK YOU for an enchanting conversation. I think you are a wonderful asset to the museum and a reason why it has become a much more enjoyable environment for art lovers to come and spend an evening. Any painter knows that empty space is his most powerful artistic weapon, if he can adequately animate it. The void need not be terrifying. Though today was a long school day, I somehow managed to come home with a burst of energy I haven’t felt in a few days. 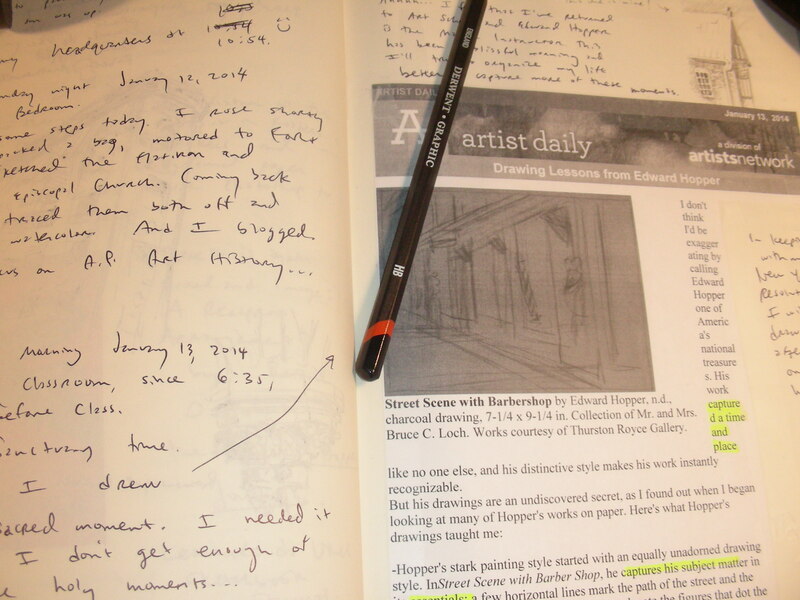 The painting was waiting on my drafting table, but I chose first to spend some quiet time reading, reflecting and writing in my journal. I came across some amazing material in The Collected Writings of Robert Motherwell, particulary his observations on the life and writings of Franz Kafka and how those elements carried over to the ethos of the Abstract Expressionist group of painters. 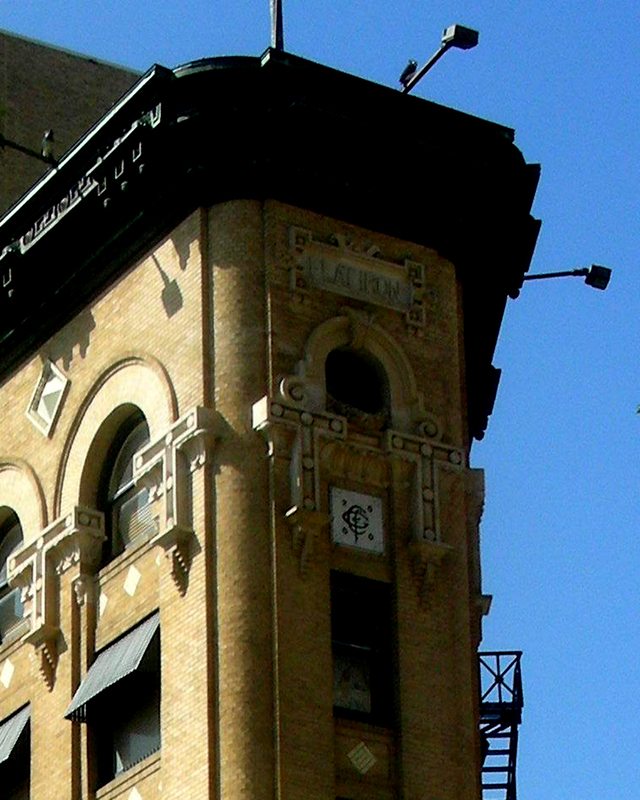 The quote above gripped me in a way that I decided to take a deep breath, and push into the facade of the flatiron building–an area that had me rather nervous because it is so light and fair in contrast to the deeply colored cornice areas. I don’t know honestly how long this evening I have been working on this–time evaporates when I enter a painting and shut out everything else. All I know now is that the fatigue factor has set in, I still have some school work to prepare for tomorrow, so I guess I’ll give this a rest for another day. Creative expression is . . . the spiritual translation of inner concepts into form, resulting from the fusion of these intuitions with artistic means of expression in a unity of spirit and form. . . . Imitation of objective reality is therefore not creation but dilettantism, or else a purely intellectual performance, scientific and sterile. What a gift this evening provided–I managed to dust off tomorrow’s class preparations late this afternoon, and am now finishing a deliciously quiet evening of watercoloring and studying. It’s been frustrating lately, working late into the nights doing school stuff and having little-to-no quality time to paint. I managed to insert quite a few more details into the crown of this Fort Worth flatiron as the evening progressed, then stopped abruptly awhile ago, realizing that I was falling into my paint-by-number syndrome. 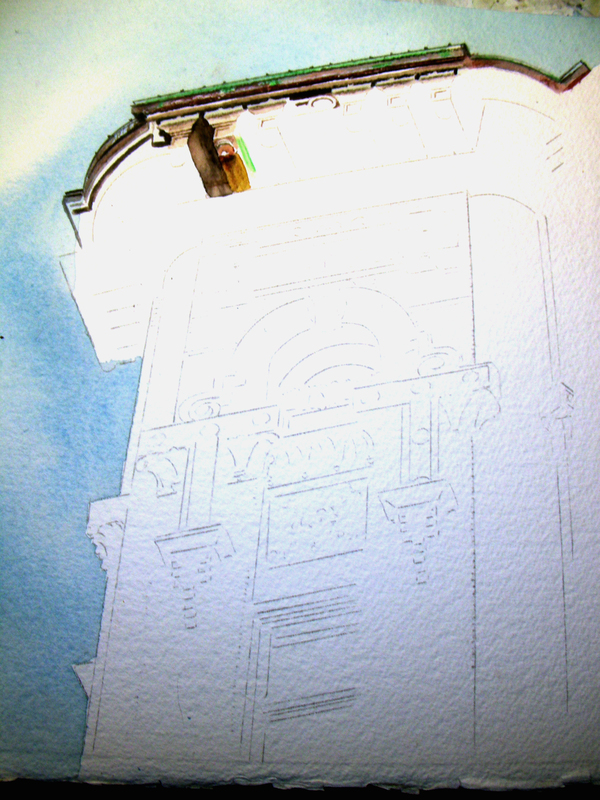 When my mind starts ranging about in extraneous ideas while only my eye responds to details on the watercolor, I feel suddenly that I am on auto-pilot, and am merely whipping out another watercolor for the trade. At this age, I am more hungry to learn, to experiment, to push the boundaries, and not repeat what I’ve done before. Abstract Expressionist painter Hans Hofmann found his way to the United States in 1934, the same year as Paul Tillich. Both men fled World War II Europe, set up shop in New York City, and began changing our world by bringing European avant-garde thought to our early twentieth century. Both men had an engaging way of applying dialectic to their disciplinary homes. Paul Tillich was fascinated with the “boundaries” separating disparate realms, and Hans Hofmann alike spoke of that energy emerging from the “push-pull.” Among Hofmann’s discussions of “push-pull”, I have decided to play with contrasts in color, both warm vs. cool and complementary pairs as well. 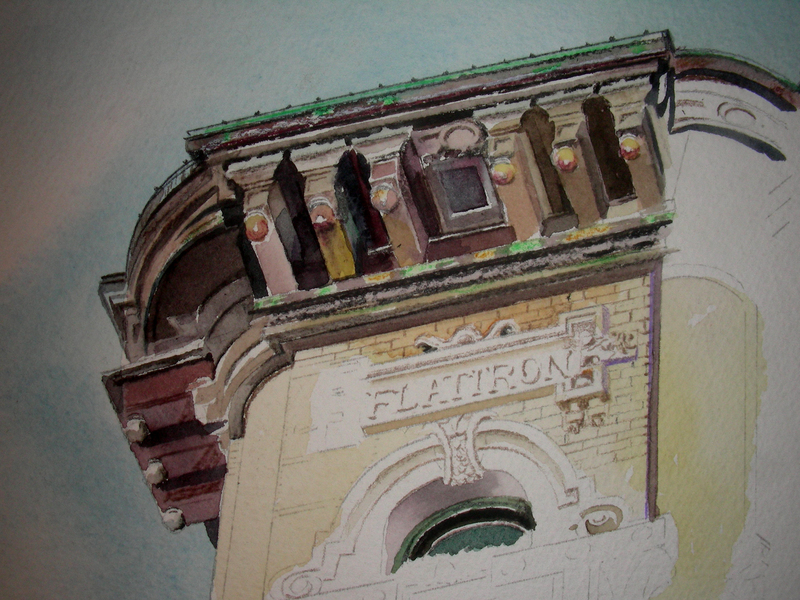 As I worked in the shadows of the cornice of this flatiron building, I continually balanced my Transparent Yellows with my Winsor Violets, and juxtaposed my Winsor Reds with mixtures of Transparent Yellow and Winsor Blue (Green Shade). My photography is quite primitive, and I hate it that my blog cannot really put the painting before my reader’s eyes in the same way that this raw watercolor gazes back at me. But I’m loving what I see with these colliding pairs of colors placed side-by-side. My shadows are showing much more dynamism than they did in the days when I relied on Payne’s Gray for cool effects or Sepia for warmth. There is so much more going on now, in the shadows, plenty of push-pull. I’m glad I stopped earlier this evening. The theories I’m reading from Hofmann and Paul Cezanne regarding complementary colors and warm vs. cool colors are giving me fresher ideas that I intend to apply to this experimental painting. Just before stopping for the evening, I looked at the work and began to realize that it was becoming academic and tight. I’ve done more than enough of that throughout my life. I want to discover new worlds in watercolor, and wish to learn something new from every painting excursion. I fear that art will become boring to me if it ever reaches a point where I am cranking out product. I blog to remember that I am not alone. 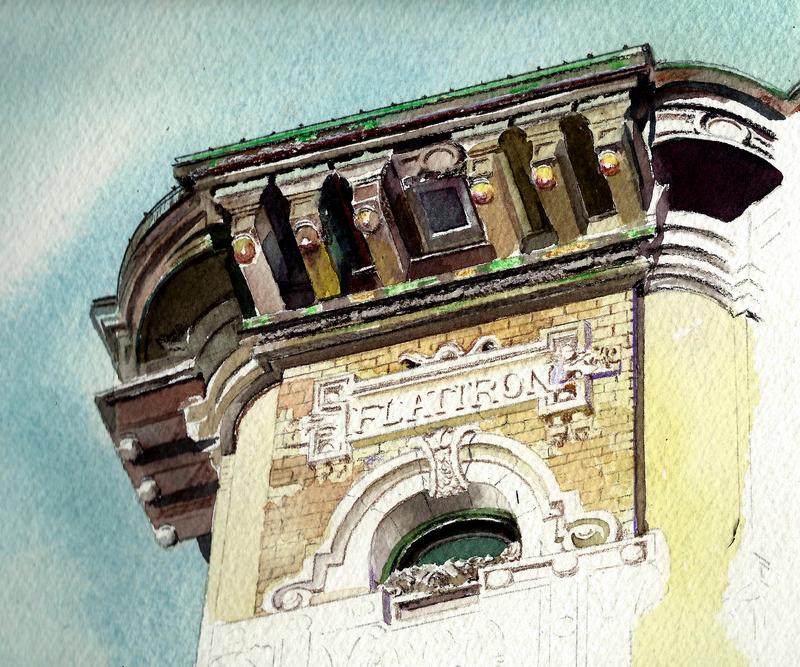 After a considerable amount of energy expended on preliminary sketches, I finally settle into a 9 x 12″ watercolor of the top portion of Fort Worth’s historic flatiron building, on the south side of downtown, Houston @ W. 9th Street. I spent a chilly, windy morning working on it today, and felt a rush of excitement while on site. I also did some preliminary sketching of the north portal of Saint Andrews Episcopal Church located on W. 10th Street @ Lamar. Coming home, I carefully prepared 9 x 12″ compositions of both studies. 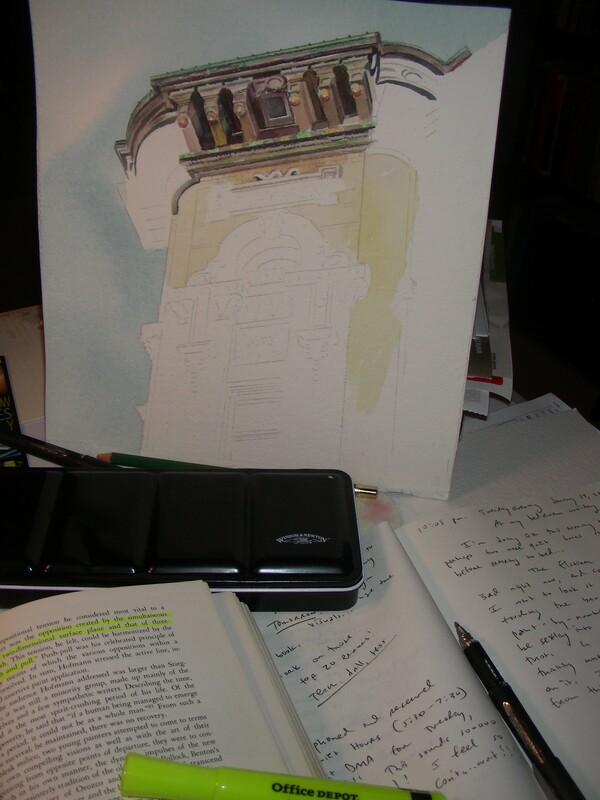 After digressing a few hours to complete my assignments for tomorrow’s A. P. Art History, I returned to the flatiron and began painting. The sky, of course, laid in quickly, but was so wet that it took quite awhile to dry out (I really do not like using hair dryers to speed up the drying process). Once it was absolutely bone-dry, I went to work on the corbels and upper regions of the cornice and immediately found myself facing dilemmas. As I stared at the iron work this morning, it didn’t take long to get past the “blackness” of its overall appearance. The blue-green patina streaks are posing a problem, but I’m determined to keep working on them. I’m also finding some interesting combinations of Winsor Violet and Transparent Yellow to work on the “bronzy” looking portions. I find myself drawing, drawing, and drawing some more as I work on this upper portion, and so far I’m enjoying all of it, though it is coming along very, very slowly. I just hope I’ll have the patience to stay with it and not try to speed up the experiment. People often express the idea that they are most themselves when they are alone; and creative artists especially may believe that it is the ivory tower of the solitary expression of their art that their innermost being finds its completion. They forget that art is communication, and that, implicitly or explicitly, the work which they produce in solitude is aimed at somebody. What a Sunday it has been, and I’m just barely past noon. Having retired to bed around 2 a.m., I thought I would sleep the best part of this day away. But shortly after 7:00, I awoke, and by 8:15 decided it was prime time to pack my art bag and hit the road. The sun was bright, the temperatures had reached 57 degrees, and I felt the call of downtown Fort Worth. My response was not without reward. As it turned out, the 17 mph winds turned Houston Street into a frigid wind tunnel, the skyscrapers channeling those north winds through the shadowed streets, ripping away at my hat and jacket. Still, the sight before me was unbelievable, and I managed to carve out charcoal sketches of the 1907 Flatiron building situated on Houston @ W. 9th Street. Climbing back into my Jeep to get warm again (the Startuck’s Coffee wasn’t doing the job), I drove around the block, and came across Saint Andrews Episcopal Church on W. 10th Street @ Lamar. 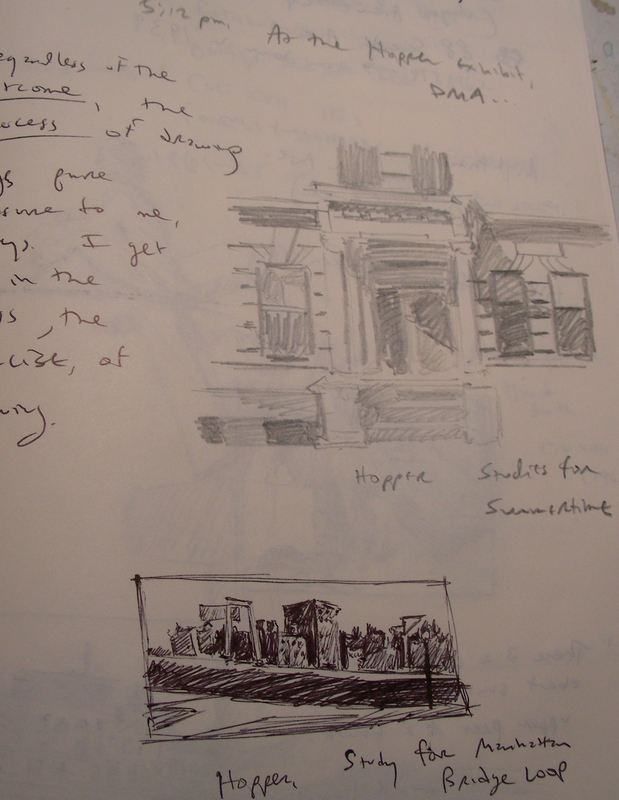 Sitting on the curb, I charcoal-sketched the north portal of that 1910 building as well. The separation of winter sun and shadows was stirring me up. I took a few reference photos, and started back to the house, but quickly decided to pass a little time at a Barnes & Noble Store and perhaps get more coffee. No such luck–the stores in Sundance Square and at University Park have both closed. I was unspeakably saddened by this–since 1995, both stores had filled my life with warm memories, provided sanctuary for journaling, sketching, reading, musing–and now both have passed away. I feel like two of my art studios have been closed down. I stopped my sketching long enough to spend time in Anthony Storr’s book Solitude, and came across the above citation from one of his earlier books. I’m never sure how to respond to this notion of the creative process and how much of it depends on solitude, how much depends on relating to other people. I never seem to have a clear-cut answer to this, because my own art work seems to happen in solitude as well as public. Yesterday, for example, I was covered up with people the entire day and it was imp0ssible to create art. But my mind never left what I was wanting to do, and I did manage to scratch out some sketches between social events, and then late last night. This morning, I set out for the task, expecting to interact with no one at all. 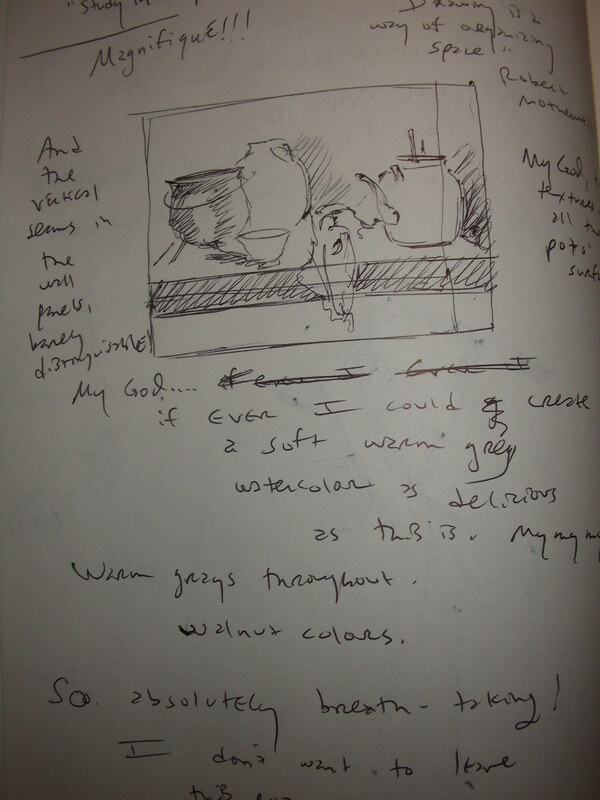 But by the time I had traveled to Fort Worth, sketched, travelled home and sketched some more, I was tagged by a number of people, through phone calls, texts, emails, blog responses, Facebook–so I cannot honestly say that I worked exclusively in solitude today. I understand the artistic sentiment that one has to be alone to create. But frankly, I have no problems finding “alone” time, and of course I manage to get a great deal of art accomplished in those “alone” times. But still, when I get covered up with people all week in school and occasionally on those weekends that come with their own set of social demands, I still manage to get things done. Perhaps it just depends on where the mind is, where the sentiment lies. 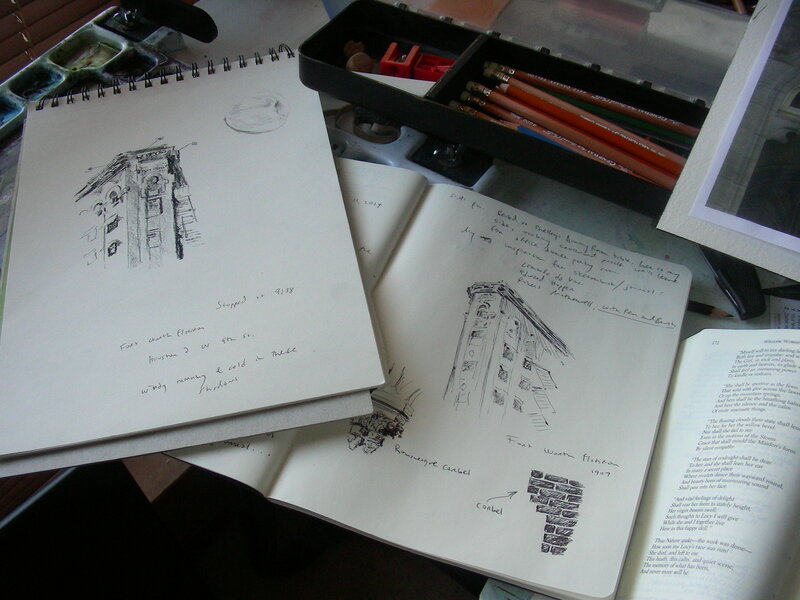 At any rate, this day is barely underway, and already it has been quite fruitful in the studios, indoor and out.